Sleep comfortably and save space with this convenient bunk bed which features a twin mattress at the bottom and full-size mattress on top. The simple and modern DHP YourZone Twin/Twin Bunk Bed features a linear design and silver finish. We like to think vertical when space is limited, and that is exactly what the DHP Joslin twin/twin bunk bed does this bed is the perfect small space solution. Outfit your room or guest room with a sleek modern sleeping space thanks to the Novogratz Maxwell Metal Bunk Bed. Twin Over Twin Bunk Bed Finished. Elegance and function combine to give this contemporary bunk bed a striking appearance. When space is limited, the Jaxon Twin over Twin Bunk Bed with Storage lets you think vertical. As one of the strongest, most durable metal triple bunks on the market, the Model Deluxe 900 bed can service your most demanding triple bunk bed needs. There is no such thing as short on sleeping space with this Furniture of America Nathan Contemporary Triple Decker Bunk Bed. Kids. Dark silver finish bunk bed convertible in two twin beds with metal ladder and great crafted fence and head and footboard with wave model. Mattress and pad sold separately.Dimensions:(L): 78-1/2 In. (W): 42 In. (H): 60 In.(Wt.) 300 lbs. With metal tube supports and full length guardrails, this bunk bed creates a safe place for all your needs. Powder Coated Steel Bunk Bed. Available in Black with Cherry Finish Wood. Easy to assemble. Strong Construction. Mattress not included in the price. Powder Coated Steel Bunk Bed with link spring. Easy to assemble. Strong Construction. Bronze Finish. Contemporary Metal Black Twin/Full Bunk Bed. Converts Easily to one Twin and one Full size Bed. Easy to assemble. Strong Metal Construction. No bunkies needed. You can put your regular Mattress right on top. Dimension: 79 In. (W) x 55 In. (D) x 67 In. (H) Twin: 79 In. (W) x 39.5 In. (D)Full Size: 79 In. (W) x 55 In. (D)***Mattress Is Not Included. If You Have Any Question About This Product, Call 1-800-939-3299. Multi-Color Twin/Futon Bunk Bed with 3 Tubing. Can Convert to a Twin Bed and a Futon. Size: 79L x 43W x 63H. Mattress and Pad Sold Separately. Features: • In a versatile silver finish for boys or girls • Constructed with metal slats and 1.2 gauge steel • It is a great value and is easy to assemble! Mattress Pillows and accessories are not included • Sleek Steel FinishDIMENSIONS: 60.5 In. H x 78 In. W x 42 In. D WEIGHT:	98 lbsQuantity Discount Available. Give a heavy metal upgrade to your kids room décor with the Powell Full Over Full Bunk Bed - Black. Multicolor Twin/Futon Bunk Bed. Details: Lenght: 80 X Width: 43 X Height 62. Very Strong. Easy To Assemble. Multicolor Twin/Twin Bunk Bed. Details: Lenght: 80 X Width: 43 X Height: 62. Very Strong. Easy To Assemble. Twin/Twin Convertible Bunk Bed With Wood Posts And Full Length Guard Rail On Top Bunk. Strong Construction. Easy To Assemble. Measures: 78 In. Long x 42 In. Wide x 65-3/4 In.(High). *In stock. This product normally leaves our warehouse within 1-2 business days. * Quantity Discount Availble. Twin/Full Futon Convertible Bunk Bed With Wood Post. Strong Construction. Easy To Assemble. Details: (Long) 78 In. x (Deep) 42 In. x (Height) 65-3/4 In. Fortuna Twin/Twin Bunk Bed With 3 Inch. Posts, Full Length Guard Rail And T-Bolt Protection, 20 Bars On Top And Botton, In Black Finish. Strong Construction. Easy To Assemble.Measures: 81 In. (W) x 43 In. (D)x 67 In.(H). Fortuna Twin/Full Futon Bunk Bed, With 3 Posts, 20 Bars On Top & Bottom, T-Bolt Protection And 1 Extra Supporting Leg & Full Guard Rail In Black Finish. Strong Construction. Easy To Assemble.Measures: 81 x 54 x 67 High. inches. 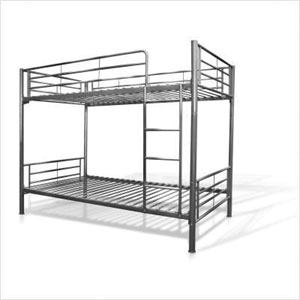 Twin/Twin Bunk Bed With Metal Cross Bars, Full Guard Rail,T-Bolt On 4 Corners. Our space-saving Futon Bunk Bed will make the most of your childs bedroom. Not just a bunk bed, the bottom bunk converts into a futon for comfortable seating. A handsome tubular design features curved side guard rails with built-in dual ladders on both sides. The solid frame is powder-coated in your choice of great decorator colors -- Red, White,Blue,Rainbow or Black. Item shown above in Black. Order this bunk today and add a versatile element to your room. Please note: The bottom bunk requires a full/double size futon mattress. A futon mattress is not included with this bed. Mattresses Are Not Included In The Price.Dimensions: 75 In. (W) x 42 In. (D) x 61 In.(H). *In stock. This product normally leaves our warehouse within 1-2 business days. * Quantity Discount Available.2091(A),2152(IEM),5413(TOP),4008(ML),82152(IEM),SC4008(HO). Wood/Metal Twin/Twin Convertible Bunk Bed.